I am going to review a lipgloss which I had received as a Christmas present. Mannnn, have I got dry lips or what. You can slightly see the lipgloss without the flash. A nice close up of the lips with flash. “Apply under regular lipstick”, nice! Review: Hmmm, well what can I say about this product! I love this product! It does what it mostly says except for the plumping. 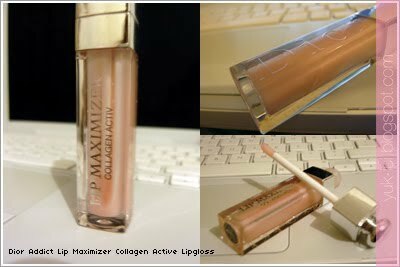 It’s non sticky as with other lipglosses I have tried and is definately hydrating. It is shiny but not tooooo shiny. Wearing it under lipstick keeps your lips moist and brings out more colour from the lipstick. Putting it over the lipstick would only make it shiny. Only comes in one shade. It looks like a milky pale pink but it isn’t very pigmented. It is suitable for anyone. It has a nice tingly feeling and smells lovely. Definately mint with a hit of vanilla! I’m tempted to do the 15 day challenge as my lips are horrible at the moment. I give it 5/5, not too fussed about the plumping, just the hydration. I researched the price and it was between £17-£20 for it (on Sephora it says $29.50). Not sure if I would buy again. Maybe to treat myself unless I have found a product which is similar to this. Nice review! I'm gonna have to get some of this =D.